Pakistani security personnel collect evidence at the bomb blast site in Mardan on December 29. One of Pakistan's most notorious extremist groups has published a visual year-ender to highlight the havoc it wrought in 2015. The Tehrik-e-Taliban Pakistan (TTP), also known as the Pakistani Taliban, has published a "2015 review" that boasts of nearly 200 attacks carried out and hundreds of victims claimed in the past year. The review, published on the TTP's website on December 29, appears to mark the first time the group has forayed into the modern world of slide presentations and glossy graphics to get its message out on traditional and social media. In the past, the group's website churned out only written statements, sometimes accompanied by cropped photos of militants and the destruction the group has unleashed after attacks. The visual PR campaign reveals that the TTP has a lot of work to do, however. The group's amateur pie charts and bar graphs pale in comparison to its media savvy rival, Islamic State (IS), which regularly produces high-quality videos, interactive graphics, and monthly magazines. IS militants also have a large following on social networking sites Facebook and Twitter compared to the TTP. 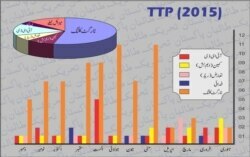 The TTP year-ender -- written mostly in the Urdu language, touted on Twitter, and available in a downloadable PDF -- boasts that the group carried out 166 attacks in the Western calendar year of 2015. That count includes 73 "targeted killing attacks," 19 improvised explosive device (IED) bombings, 17 missile attacks, 12 ambushes, and five "self-sacrificial" attacks. The militant group also said it killed more than 700 people, and destroyed 47 Pakistani police and army vehicles as well as two helicopters. It is impossible to verify the casualty claims made by the TTP. It is not uncommon for such figures to be inflated by extremist groups, and the numbers provided by the government about militant deaths are also often overstated. The TTP entered 2015 as the target of a major government offensive following the extremist group's gruesome ambush of a military-run school in the northwestern city of Peshawar in December 2014. The attack left 147 people dead, the vast majority of them students. Despite the effort to push the militant group out of the lawless tribal areas along Pakistan's western border with Afghanistan, the insurgents managed to carry out a number of deadly attacks in 2015. In January, an explosion ripped through a Shi'ite mosque in southern Pakistan, killing more than 60 people and wounding dozens. In March, 15 people were killed and scores injured after suicide attacks at two churches in Lahore. In September, the Pakistani Taliban killed 30 people in an attack on an Air Force base in northwestern Pakistan. And on December 29, more than 20 people were killed and dozens wounded when a suicide bomber blew himself up outside a government office in the country's northwest, an attack claimed by a breakaway TTP faction.